"A classically easy chili recipe with four additional variations ranging from Cincinnati to Morocco." 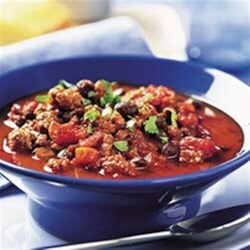 Beer, unsweetened cocoa powder, and cinnamon add a depth of flavor to this chili. Cook's Tip: One can (14-1/2 ounces) diced tomatoes combined with 2 tablespoons diced canned chiles may be substituted for diced tomatoes with green chiles. Cook's Tip: Cooking times are for fresh or thoroughly thawed ground beef. Ground beef should be cooked to an internal temperature of 160 degrees F. Color is not a reliable indicator of ground beef doneness. Cook's Tip: For a thicker consistency, prepare as directed, adding 1 tablespoon cornmeal with ingredients in step 2. This recipe is an excellent source of protein, niacin, vitamin B6, vitamin B12, iron, selenium and zinc; and a good source of fiber and choline. Too much spice for me, so I reduced the amount of chili powder significantly. Otherwise, it was really good with some saltines on top! I liked this, but my kids didn't. I didn't use chili powder or broth. I would make it again. Super easy! Quick and easy, this was a tasty chili. I added red kidney beans to the mix and it was perfect for us.